Let’s clear one thing up to start with… I definitely need more practice BUT it was so much fun! Saturday afternoon Alex and I journeyed to Wembley Park for a browse around the market, the shops and some ice skating. I was invited for a skating session and knew Alex would love it too – He’s like a penguin on skates, a natural. 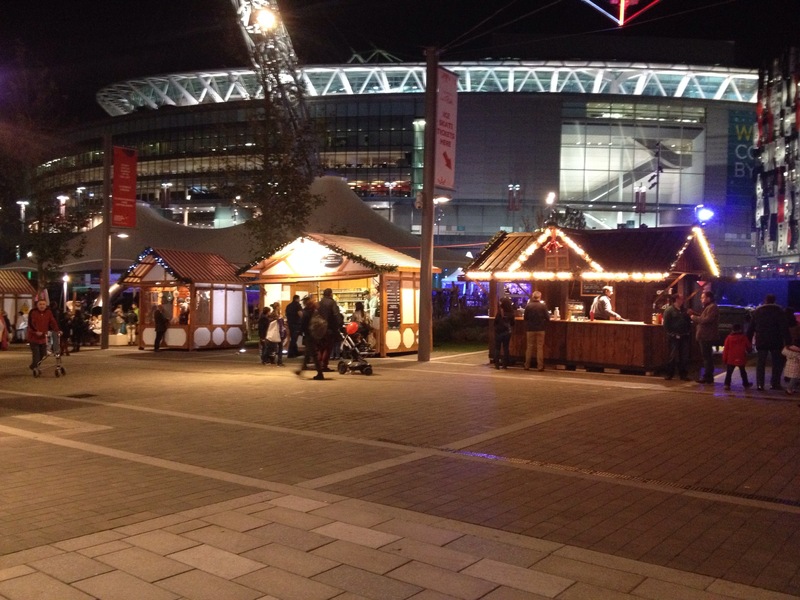 Right beside Wembley Stadium and the London Designer Outlet Wembley is now home to a cute christmas market and it’s first ice rink – the only outdoor ice-rink in North West London – which was opened on the 14th November by Suzanne Shaw, former Dancing on Ice champion. 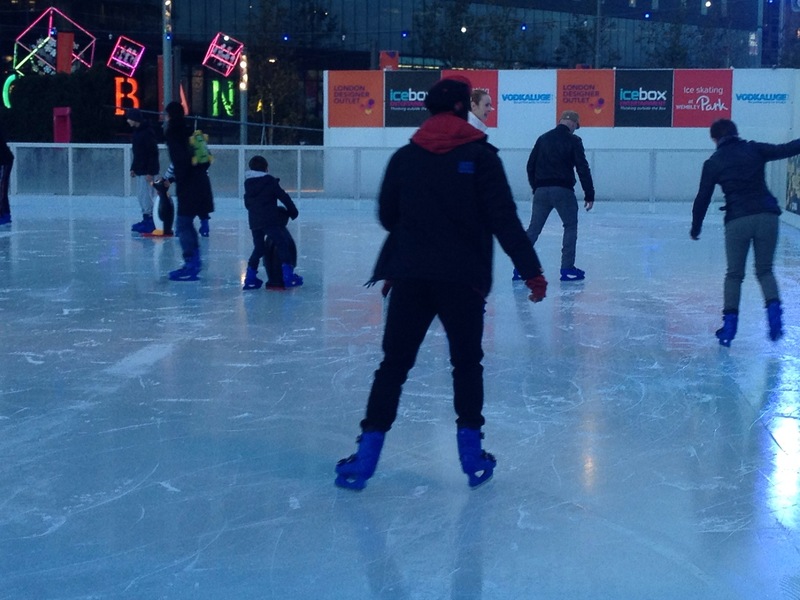 The Ice Rink is actually part of the London Designer Outlet’s winter programme of events which are helping to raise funds for its charity partner, Ray’s of Sunshine. 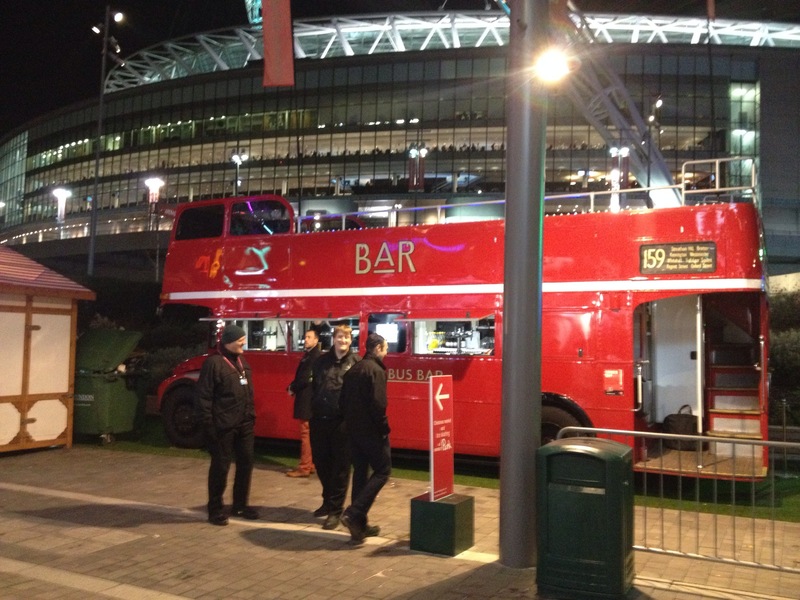 As saturday was the day of the England qualifier at Wembley Stadium – I didn’t take this into consideration with the travel time…whoops! 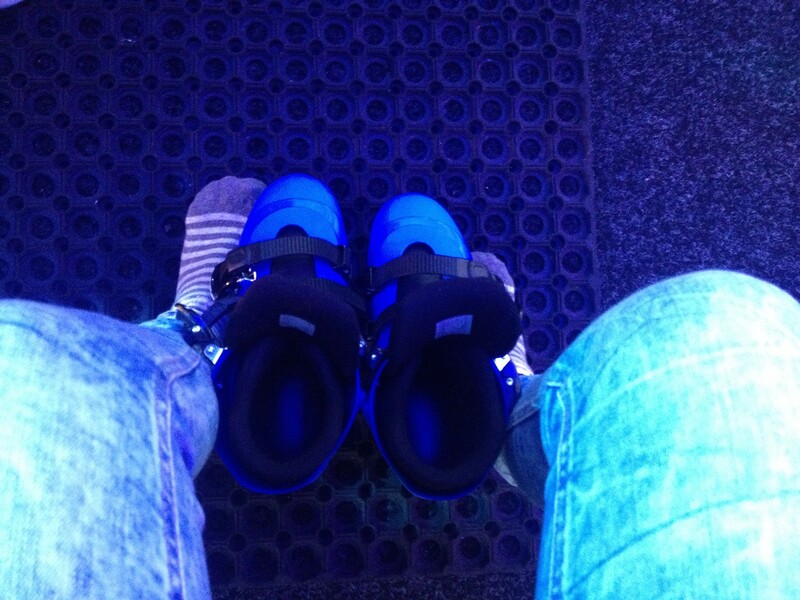 – we headed straight for the ice rink to start with. The box office wasn’t too busy at that time luckily as most people for our session had paid and started to queue at the entrance to the skate hire. We were greeted by a friendly team who sorted us out and we were soon in exchanging trainers for skates and strapping our feet in. Whilst everyone was fitting their skates inside they even had a member of the team going round making sure everyone was ok with the straps and that we all had the right sizes. We then had a short wait whilst the team finished re-surfacing the ice. It was time! Everyone started making their way on to the ice, one by one gripping the outside for support until they got used to it. That was me too 😛 But as you can guess, Alex was off! I soon got a little more used to it and was trying to glide rather than walk on the ice as Alex was telling me I was doing. It was very slippy due to being re-surfaced before our session and my one skate did keep slipping out – I tried to blame the skate and ice, but Alex insists it was me trying to push the blame haha… which sadly is probably true! They started playing music too whilst we were skating, the christmas songs actually made me feel a little festive! Can you believe it? 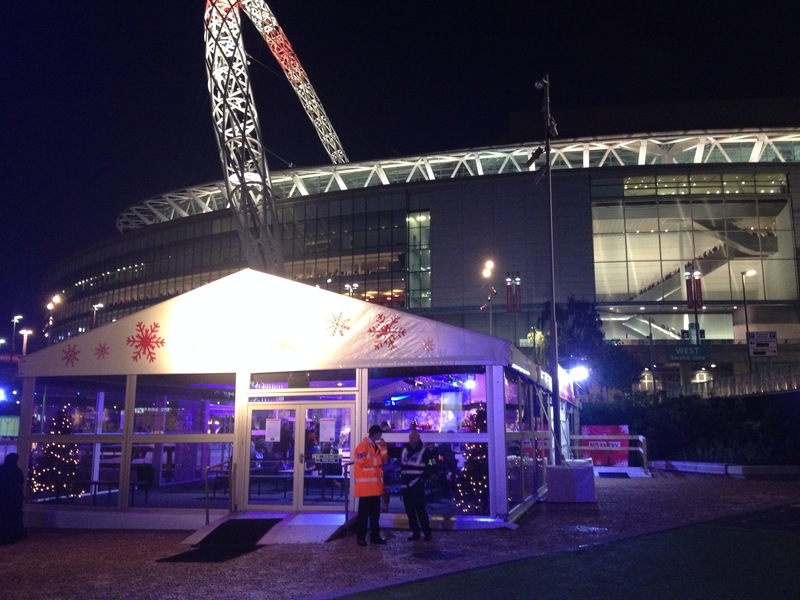 It was really nice skating with Wembley Stadium in the background and christmas music over the speakers – a great location and atmosphere! Alex and I tried skating with me behind – basically me gliding and him doing all the work. What are boyfriends for, right? This was actually pretty good and got me a little more confident too! I really enjoyed skating together. He did say my concentration was hilarious – I was concentrating so hard on my technique and balance…I have a fear of falling that’s for sure! The 45 min session came to a close and we all made our way back inside, re trainer-ing up and preparing our legs for the motion of walking. 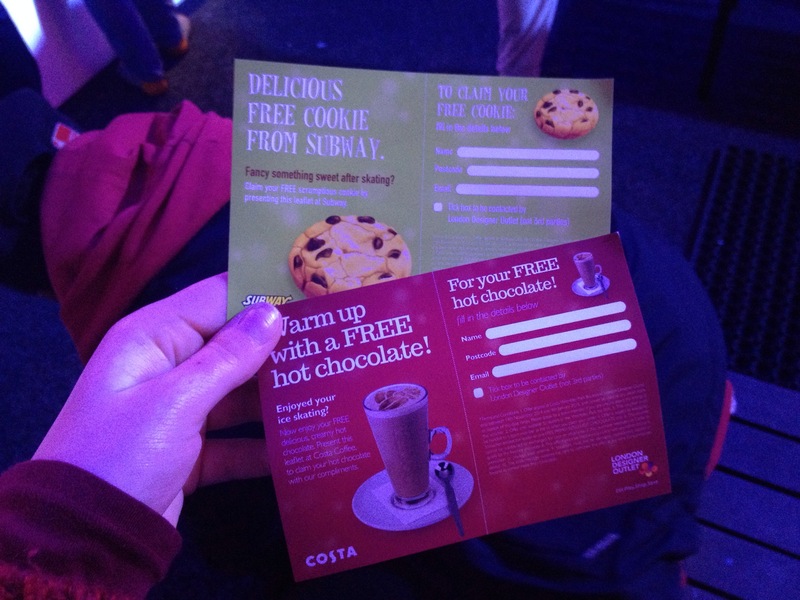 With our shoes came a voucher for a free hot chocolate from Costa too, and a cookie from Subway – an early bird treat for those using the ice rink! Delicious way to warm up after! 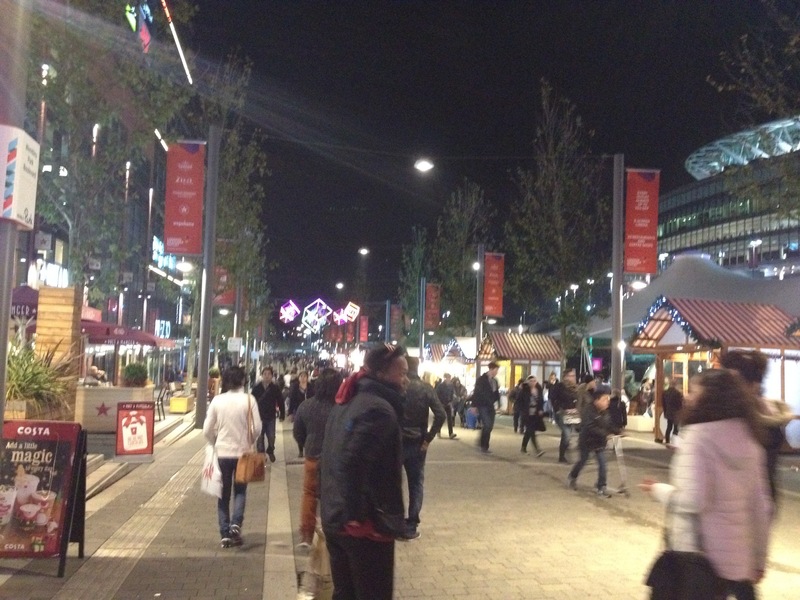 Alex and I then had a stroll around London Designer Outlet. 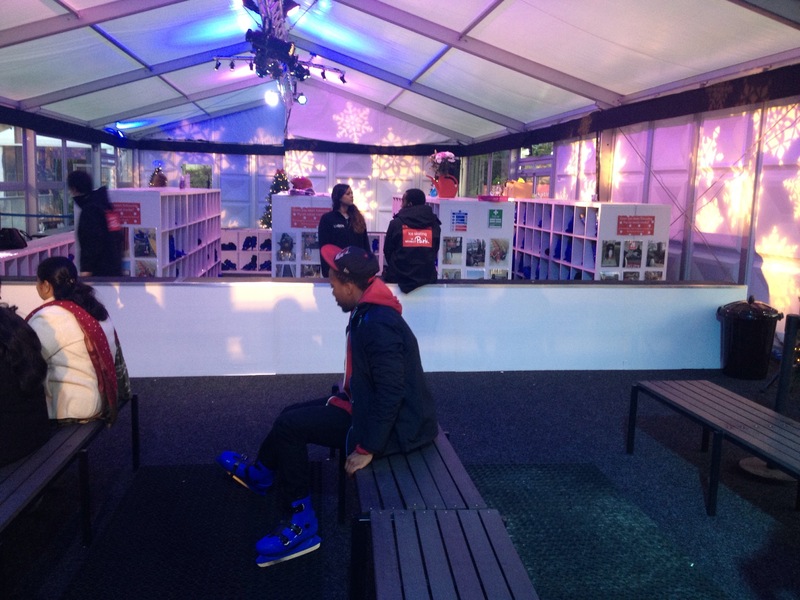 It was so nice having everything in one place – shopping and a fun time on the ice! London Designer Outlet is so much bigger than I thought too. 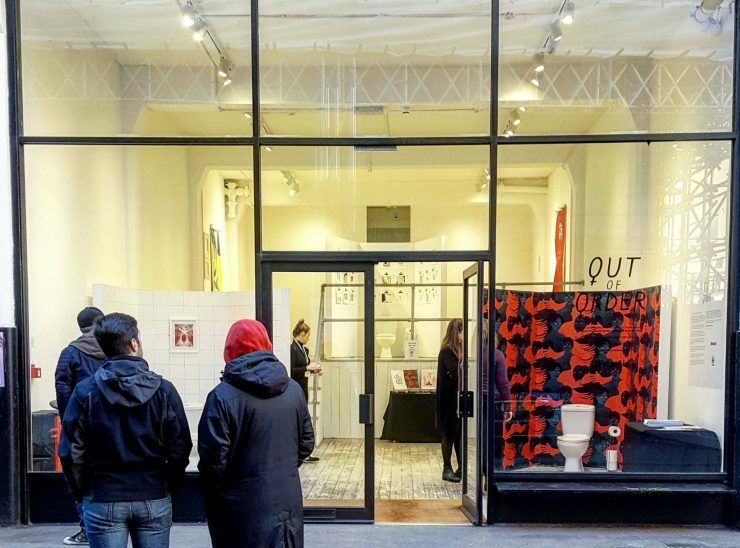 I didn’t realise they have a Cineworld, numerous restaurants and all those shops – it’s actually just celebrated it’s first anniversary. We did a little shopping for Alex, picked up our free subway cookies – these were delicious later on (we took them home for our treat! 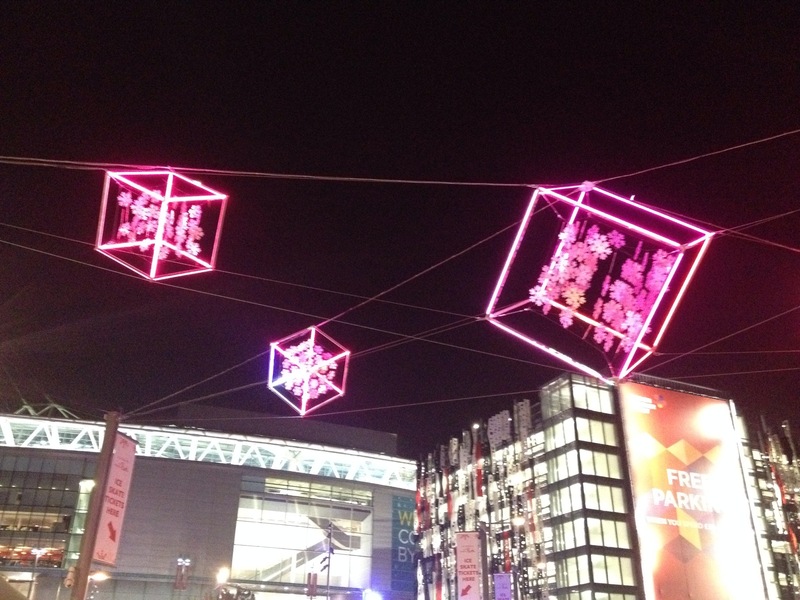 ), and then strolled back out along the christmas market stalls. 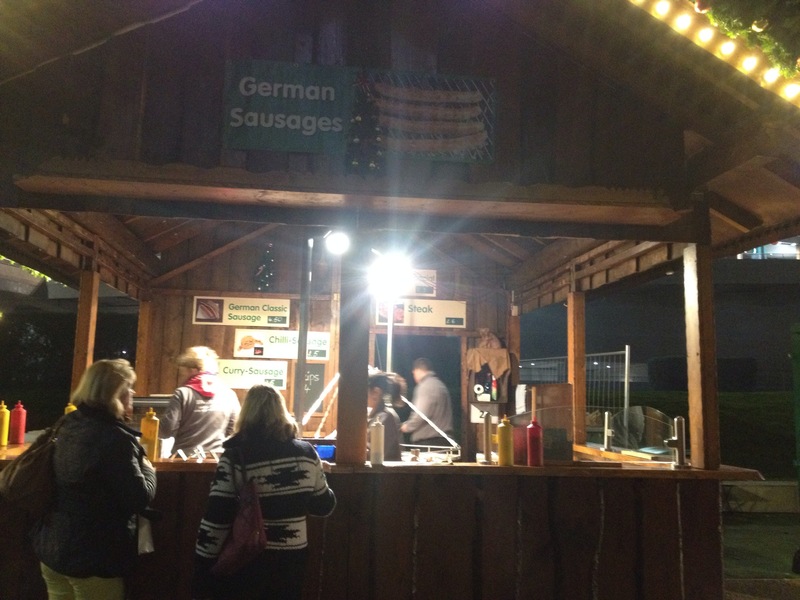 I really liked the lights..
We were just too tempted by the German Sausage stall that we had to get a chill sausage to share before heading home. 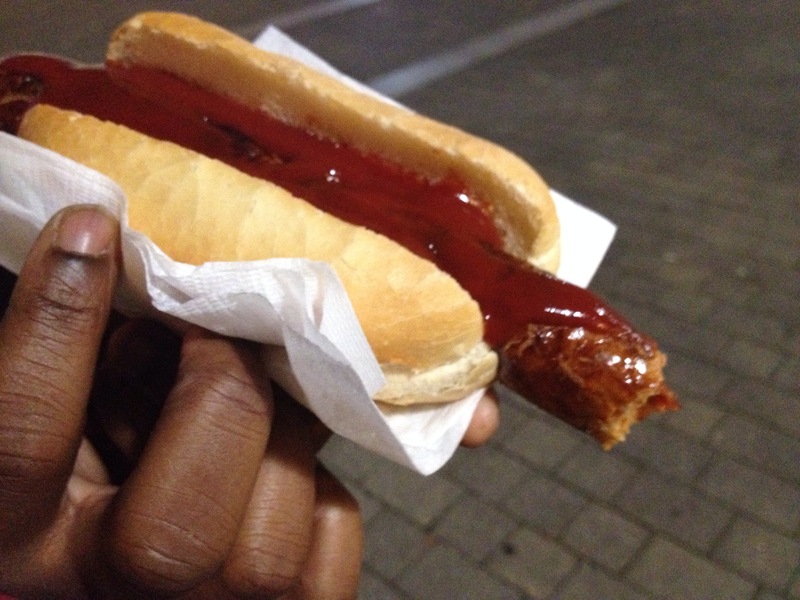 It was really yummy and a nice finish to our lovely afternoon in Wembley Park. 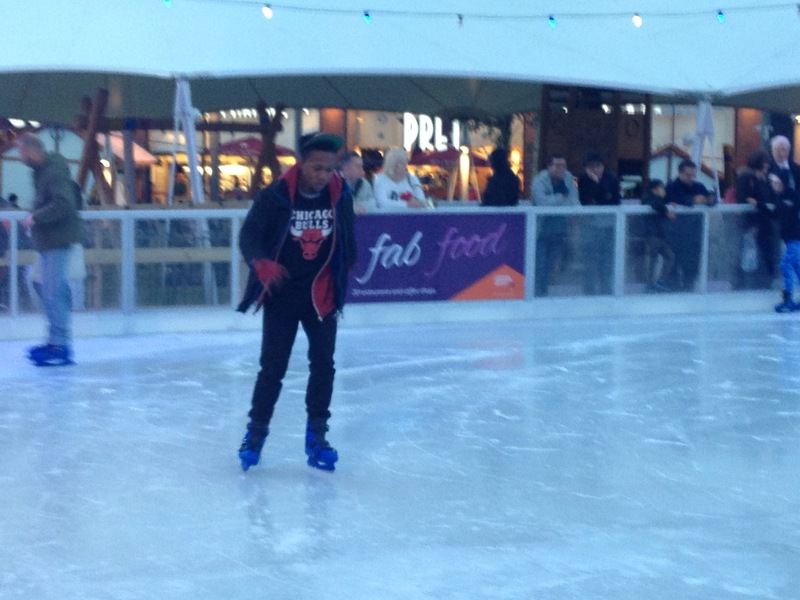 I will definitely be returning – It’s a fab area with so much going on, they really do offer something for everyone and I had so much fun ice skating, even if I did get a little annoyed with my feet sometimes 😛 … Really do need some more practice! Tickets are only £12 for an adult during peak time and £8.50 for children 12 & under, and they open until late too. I hope you all had a fab weekend too! SW to stay the most sought after postcode?